SANTANDER DE QUILICHAO, COLOMBIA (CNN) -- Colombian riot police may have fired live bullets at Indian protesters, according to a videotape that CNN obtained. The footage comes despite a government pledge that security forces would not do so. 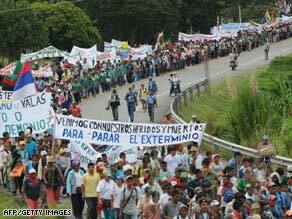 Demonstrators march along the Pan American Highway on Tuesday in Piendamo, Colombia. The tape shows what appear to be riot and regular uniformed police at southwest Colombia's La Maria Indian reservation in a region where thousands of Indians have been protesting since October 10 for greater land rights and against free-market capitalism. Filmed by an Indian protester, the video appears to show a man in an olive green uniform and ski mask raise an M-16 assault rifle, standard issue for some Colombian police units, and fire three shots, though the target is unclear. Indian leaders said five Indians were wounded in shootings Thursday, the day the video was taken. CNN obtained the video Tuesday and did not see the alleged casualties. Neither the police nor the government is keeping tally of the protesters wounded. President Alvaro Uribe denied accusations this week that security forces have fired at demonstrators during the burgeoning protests by Indians who want more land, better education and health care and protection from corporations encroaching on their land. The demonstrations have spawned violent clashes between authorities and protesters, armed in some cases with slingshots and Molotov cocktails. At least four protesters have been killed, including two on Tuesday, and at least 130 have been injured, Indian leaders said. Medics said they have treated scores for gunshot and shrapnel wounds. The government said as many as 70 security force members, mainly riot police, have been hurt. In a TV address this week, Uribe repeated assertions by top police officers that protesters may have been carrying weapons and homemade explosives -- and that they may have wounded and even killed their own comrades. The video that CNN obtained was shot Thursday, according to the activist who filmed it. The footage shows a recognizable building known to be at La Maria reservation. CNN showed the video clip to Col. Jorge Enrique Cartagena, national commander of the Colombian riot police, known as the Mobile Anti-Disturbance Squad. He and other police officials in Bogota said they would investigate. "We will investigate to see what police officer fired that gun because orders are not to open fire," he said. "Riot cops are the only ones authorized to fire, and they must only use gas grenades." Cartagena said police rifles were not capable of firing rubber bullets. He said the rifles could fire blanks, but he said blank rounds were not used to quell riots and he had not given any orders that they should be used. He said percussion grenades, not blank shots, were used to stun and frighten protesters. Cartagena also is investigating shootings that killed two protesters Tuesday along the Pan-American Highway, a main trade route in South America. Two men were shot to death near Villarica, a town in the southwestern Colombia province of Cauca. They were both shot in the back and head, according to police, a government human rights ombudsman and a CNN reporter who saw one of the corpses. Five others were wounded, peasant leaders said. Protesters said police fired on the men as about 200 peasant farmers and Indians tried to join a much larger group marching toward Cali, the nation's second-largest city. Cartagena said protesters attacked police with homemade explosives and that one man died after other demonstrators opened fire. "We think he was shot from within the crowd, and they're doing that to whip up anger," he said.